Summary: Is visualization more than just positive thinking? Visualization, a common spiritual practice in Eastern, Protestant, and Catholic religious circles, is more than just conjuring up thoughts and pictures. In fact, guided visualization is hypnosis. Visualization and hypnosis are used extensively in sports therapy. It is important to remember that meditation in any form is the harnessing, by human means, of God's divine laws...We are endowed with a great many powers and forces that we do not yet fully understand. If visualization is unBiblical meditation, then what is Biblical meditation? Mine eyes prevent the night watches, that I might meditate in thy word (Psalm 63:6, 77:12, 119:148). 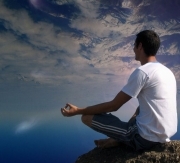 The word "meditate" as used in Scripture is שׂיח, which means to ponder, converse, commune, pray, and speak with. Visualization through repetitive mantras or hyponosis is not Biblical meditation because it does not involve conscious thought or response. True meditation is Word-based. When we study Scripture, using our full minds and hearts to process the information, applying it to our lives and relationship with God, we start to become more like Him. Meditation and prayer means talking with God as a friend, not just chanting at Him. If God really is our Father and our Friend, does He need to hypotize us in order for us to know Him better? No. The true love God has for us draws us to Him, and allows us to communicate with Him. Visualization, or hypnosis, is becoming as popular in sports circles as in religious ones. Hypnosis, by design, by passes the frontal lobe as it helps the subject enter a trance-like state. Hypnotism is a popular method for dealing with things ranging from common bad habits to emotionally devastating childhood trauma. Hypnotism appears to perpetuate current depression or set the stage for future depression, by decreasing overall frontal lobe activity and by upsetting the balance between the right and left frontal lobes. i. Martin and Deidre Bobgan quoting Michael Harner in Hypnosis: Medical, Scientific, or Occultic (Santa Barbara, CA: EastGate Publishers, 2001), p. 82.
ii. Paul Yonggi Cho, The Fourth Dimension (Bridge-Logos Publishers, 1979): ix-x. vi. Godfre Ray King, Unveiled Mysteries (St. Germain Press, 1989): 101.